Following its highly successful showcase at the Grandmaster’s Palace in Valletta, The Majlis – Cultures in Dialogue, a traveling cross-cultural exhibition organised at the initiative of the Sheikh Faisal bin Qassim Al-Thani Museum – that features a collection of a unique assembly of artefacts reflecting the interaction of civilizations in the past while encouraging dialogue in the present – raised its curtains to welcome more than 200 VIP guests on 29th November at UNESCO Headquarters – Paris, taking the audience’s delight to a new height with a specially composed song ‘Cultures In Dialogue’, by the legendary female Qatari composer Dana Al Fardan. Mr. Kees Wieringa, Director of the Sheikh Faisal Bin Qassim Al Thani Museum, in the presence of Sheikh Faisal Bin Qassim Al Thani and Mr. Xing Qu, the Deputy Director General of UNESCO, welcomed a number of journalists from highly esteemed French and international media for engaging guided tours during the day. Preceding the inauguration delegates’ speeches, VIP guests had the opportunity to view the astonishing and exceptional collection that bear witness to hundreds of years of intercultural dialogue and interaction of civilizations, through a guided tour around the exhibition. Objects of great beauty and deep fascination including Chinese Qurans, mosque lamps made in Vienna, Persian carpets with Russian texts featuring the Virgin Mary, and mystic artefacts shared from Africa across the Arab world to India, were the prime highlights, triggering a diversification of thoughts and emotions. H.E. Sheikh Faisal Bin Qassim Al Thani and Mr. Xing Qu addressed government, cultural and corporate representatives from Qatar and France with warm welcoming words, as they celebrated the opening of the exhibition at UNESCO Headquarters in Paris. 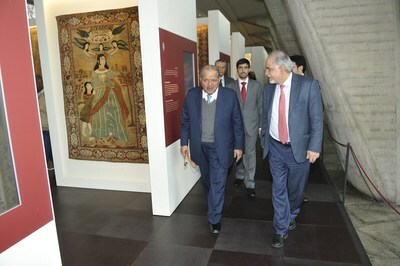 Showcasing an exceptional collection, the exhibition intends to drive visitors to sit in the majlis to listen to stories and engage in conversations on what they see; transmitting the cultural dialogue by exchanging their impressions of the exhibition and learning about other cultures and religions at first hand. This diverse cultural exhibition recreates the atmosphere of the majlis-the space of hospitality and dialogue present in homes throughout the Arabian Gulf-offering guests the opportunity to exchange ideas about how much common ground exists between different cultures, and how these commonalities have been expressed in technology, art and culture. The exhibition is only the beginning of a much bigger project to connect people, beliefs and cultures by creating opportunities for respectful, yet incisive dialogues to take place. The project envisions to create a platform where relevant cultural aspects can be discussed, and original perspectives can be generated through collective thinking. The aim is to initiate meaningful connections between people and cultures and stimulate enriched dialogue around the world. The Majlis – Cultures in Dialogue is a visitor’s experience that reveals how global perspectives can vary depending on the position of the viewer. Following Paris, the exhibition will visit several countries, including Austria, Germany, Spain, Turkey, and the UK. The tour will also include the United States by 2021. The cross-cultural traveling exhibition is bound to make its next stop at the Insitut Du Monde Arabe, in Paris, where it will last for a 2-month period. ABU DHABI, Marking the UAE 47th National Day, H.H. Sheikh Abdullah bin Zayed Al Nahyan, Minister of Foreign Affairs and International Cooperation, has said that the UAE will continue, with great determination, to continue its progressive development journey. In a statement to ‘Nation Shield’, the UAE Armed Forces magazine, Sheikh Abdullah bin Zayed said, that the UAE has, via its balanced policies and objectives, become a model for advancement and a capable actor in regional and international levels. Below is the statement in full: “This year, the 2nd of December marks the forty-seventh anniversary of the founding of the UAE. On this day, we recall the determined efforts of the late Sheikh Zayed bin Sultan and the Founding Fathers that built our young nation. “Upon the formation of the Union, the story of one of the most successful experiences of unification in modern history, with an objective, that continues to this day and beyond; to continue attaining levels of excellence and progress moving beyond any ordinary limits. “The UAE, led by President His Highness Sheikh Khalifa bin Zayed Al Nahyan, His Highness Sheikh Mohammed bin Rashid Al Maktoum, the Vice President, Prime Minister and Ruler of Dubai, His Highness Sheikh Mohamed bin Zayed Al Nahyan, Crown Prince of Abu Dhabi and Deputy Supreme Commander of the UAE Armed Forces, and Their Highnesses, Supreme Council Members and Rulers of the Emirates, continues, with great determination, its development journey. “The progress and development witnessed by our young nation are built on a balanced foreign policy based on values of moderation, justice, and altruism. The UAE has become a global symbol of philanthropy. The UAE’s diplomacy has succeeded in building bridges of friendship and cooperation between countries around the world, strengthening its presence as a capable actor in regional and global arenas. BAGHDAD, The Security forces arrested three elements of Daesh in Kirkuk province. BAGHDAD, The Ministry of Oil announced the total oil exports and revenues achieved for the month of last November, according to preliminary statistics from the Iraqi Oil Marketing Company (SOMO). Jihad pointed out that the daily rate of export reached (3,372) million barrels, (3,363) million barrels of oil exported through the southern ports and (8,716) thousand barrels from the Turkish port of Ceyhan through the northern port. Jihad said that the average price per barrel amounted to (61,090) dollars. He said that the Ministry, through its belief in informing the people about the export operations and the revenues derived from it, took this monthly action. Najaf, The Popular Mobilization forces arrested two wanted men on terrorism charges at the entrance to Fallujah. “The terrorist named Abu Ayman al-Mohammadi and the terrorist Aqeel Abdul Ghani were entering the city of Fallujah,” said the Imam Ali Division media in the east of Anbar. Baghdad, The Ministry of the Interior announced the arrest of one of the elements of terrorist Daesh wanted for the judiciary in the province of Nineveh.